So today I went to lunch with a friend of mine. We have been friends for years. We got to know each other the year I moved here. 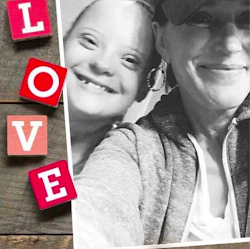 Her daughter, who also happens to have Down syndrome, is one year older than ME. Nearly all of my kids are many more years older than her oldest child. So we are learning from each other. We are sort of kindred souls. Both of us very passionate. Both of us wanting the world to know how amazing each of our girls are. Simply said, we have been through a lot together. Today, we got to talk about our journeys. She is an action person. She will move mountains locally, and quite possibly globally. I am a writer. I will share my journey through words. Locally and quite possibly globally. We are doing the same thing. Today, I realized that. I think we both realized that. My words matter, and her actions matter. I enjoyed the lunch immensely. I am grateful for this friend. I always have been. I am grateful we got to just enjoy our friendship. This entry was posted on Tuesday, March 24, 2015. You can follow any responses to this entry through the RSS 2.0. You can leave a response.